Our 378 children collected 3602 Green Footprints and had a lot of fun. Unfortunately only the way in the morning was counted so we couldn't gather that many footprints. There were about 2000 children in over 30 schools around St Vith that have been collecting again in autumn. 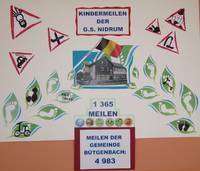 In the municipality Büllingen 420 children in six schools (Büllingen, Honsfeld, Hünningen, Mürringen, Rocherath-Krinkelt and Wirtzfeld) collected enormous 4072 Green Footprints. During the Mobility Week the childrne were all absorbed by the theme Climate Change. Children, teacher, parents and I did all like the project very much! The children learned a lot of little things that all together can help a lot. We're looking forward to ZOOMing in again in 2014.